GIA revolutionized the diamond industry in 1955 with its Diamond Grading Report. Based on the 4Cs of diamond value and International Diamond Grading System™, both of which GIA created, the grading report provides a comprehensive analysis of quality and authenticity for diamonds in the D-to-Z color range. It contains information on diamond shape and cutting style; measurements and weight; proportions and finish; grades for clarity, color, and cut; and any known treatments. 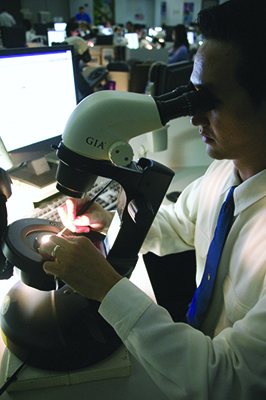 While a number of laboratories issue similar reports, the GIA Diamond Grading Report has earned a preeminent reputation for unrivaled accuracy and integrity when assigning diamond grades. The GIA Diamond Grading Report, Diamond Dossier, and Gemological Identification Reports for colored stones and pearls offer unmatched assurance of a gem's quality and authenticity.